Shrimp are incredibly versatile and quick-cooking, making them perfect for busy weeknights. 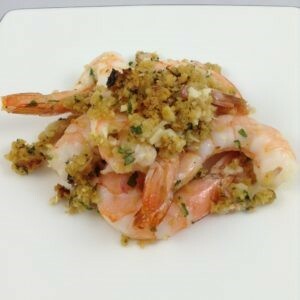 One of my favorite ingredient combinations is shrimp and garlic – a match made in heaven. And in less than 30 minutes, you’ll have this baked dish on the dinner table. Serve it with some simple steamed or stir-fried greens for a nutrient dense and delicious meal. Tip: Feel free to use frozen, raw shrimp that is already shelled and de-veined. Put it in a covered bowl in the refrigerator in the morning and it will be ready when you are at the end of the day. 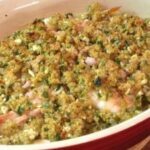 So, skip the boring chicken dinner and try this super easy shrimp instead! If not already done, peel the shrimp, leaving the tails on, and de-vein them, Place them in a large bowl and add the olive oil, white wine, 2 teaspoons of the salt and 1 teaspoon of the freshly ground black pepper. Toss well to coat the shrimp with the marinade. Set aside. In a medium bowl, mix the butter, garlic, shallots, parsley, red pepper flakes, lemon zest, lemon juice, egg yolk, bread crumbs and remaining salt and freshly ground black pepper. Use your fingers to make sure the mixture is crumbly. 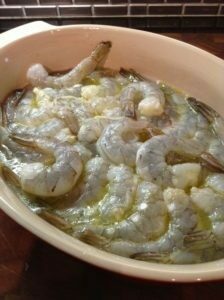 Pour the shrimp, including marinade, into a shallow baking dish just large enough to hold the shrimp in a single layer. 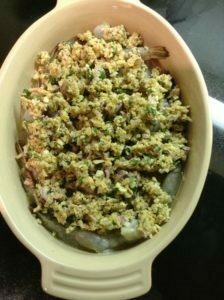 Crumble the breadcrumb mixture evenly over the shrimp. Bake in the preheated oven until bubbly and the topping has lightly browned, about 12 to 15 minutes. Serve immediately.